Some time ago, I mastered my mom’s pie crust recipe. 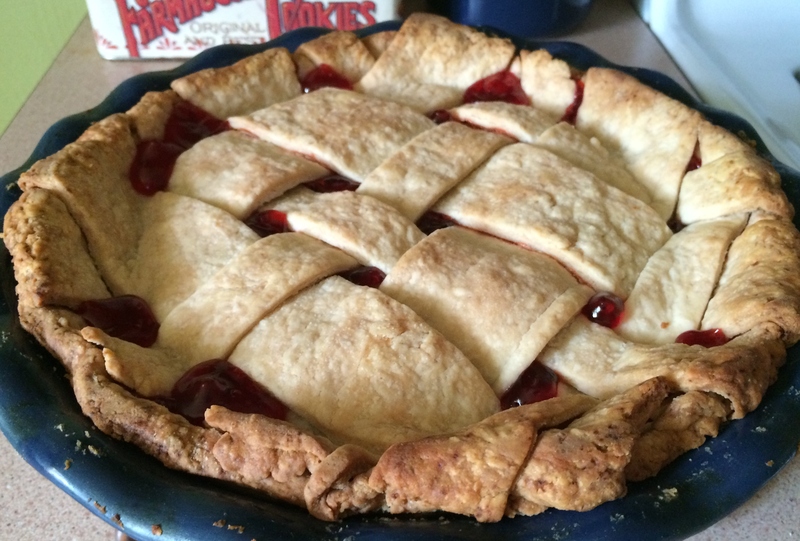 While I can make a nice, flaky crust, my crust decoration skills – like latticework and fluted edges – leave a lot to be desired. Today I chose to practice latticework, based on a plaid lattice design I saw from King Arthur Flour. And because I wanted to focus my attention on the crust and not the filling, I used canned pie filling. That’s right. Canned pie filling. Go ahead and gasp in shock, because you know how I’m a huge proponent of scratch baking and I’ve even blogged about how I couldn’t consider myself a “real” pie baker without being able to make crust from scratch. Here’s the thing, though…sometimes, in the interest of practicing your lattice work, you want to focus on the crust and not the filling. Or, you really want a pie but your fruit of choice is out of season. Or you simply just don’t have time to peel apples or pit cherries or slice peaches. Most of us use canned pumpkin for our pumpkin pies, don’t we? We’re not roasting pumpkins and scraping out the flesh and spicing it up with cinnamon. Nope, we’re popping open a can and mixing that puree with various sugars and spices. So, this made me wonder…when did canned pie filling come on the scene in American baking? Probably about the same time that Rosie left her kitchen to become a riveter but was still expected to run a household, pie baking included. Whatever you choose to do, I salute you, fellow pie bakers. If you have any good tips on mastering latticework, please let me know! Prepare pie crusts; line an 8-inch pie plate with one crust and reserve the second crust for the lattice top. Roll out your second crust, then cut into strips for the lattice. I cut mine into four 2-inch strips and four 1-inch strips. To make the lattice, place two 2-inch strips and two 1-inch strips onto your filling, alternating two-inch, then one-inch, then two-inch, then one-inch. Fold back half of the strips and lay another 2-inch strip on your filling so that it is perpendicular to the other strips. Fold the other set of strips back so they cover the new strip, then repeat with the remaining strips (again, using the two-inch, then one-inch pattern) to form the lattice. This diagram at King Arthur Flour works very well as a guide for latticework. Fold the edges of your lattice strips over the edge of your bottom crust and crimp the edges as desired. Place a pie guard or foil around the edge of your crust and bake for 20 minutes. Remove the pie guard or foil and reduce oven temperature to 375, then bake for another 30-35 minutes. You may need to place your pie guard back on again for the last 10 minutes of baking. That turned out gorgeous! I’ll have to show Robb; he will love the plaid.